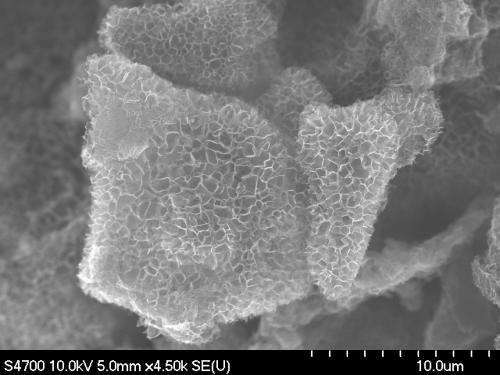 3D graphene: Solar cells' new platinum? One of the most promising types of solar cells has a few drawbacks. A scientist at Michigan Technological University may have overcome one of them. Dye-sensitized solar cells are thin, flexible, easy to make and very good at turning sunshine into electricity. However, a key ingredient is one of the most expensive metals on the planet: platinum. While only small amounts are needed, at $1,500 an ounce, the cost of the silvery metal is still significant. Yun Hang Hu, the Charles and Caroll McArthur Professor of Materials Science and Engineering, has developed a new, inexpensive material that could replace the platinum in solar cells without degrading their efficiency: 3D graphene. Regular graphene is a famously two-dimensional form of carbon just a molecule or so thick. Hu and his team invented a novel approach to synthesize a unique 3D version with a honeycomb-like structure. To do so, they combined lithium oxide with carbon monoxide in a chemical reaction that forms lithium carbonate (Li2CO3) and the honeycomb graphene. The Li2CO3 helps shape the graphene sheets and isolates them from each other, preventing the formation of garden-variety graphite. Furthermore, the Li2CO3 particles can be easily removed from 3D honeycomb-structured graphene by an acid. The researchers determined that the 3D honeycomb graphene had excellent conductivity and high catalytic activity, raising the possibility that it could be used for energy storage and conversion. So they replaced the platinum counter electrode in a dye-sensitized solar cell with one made of the 3D honeycomb graphene. Then they put the solar cell in the sunshine and measured its output. The cell with the 3D graphene counter electrode converted 7.8 percent of the sun's energy into electricity, nearly as much as the conventional solar cell using costly platinum (8 percent). Synthesizing the 3D honeycomb graphene is neither expensive nor difficult, said Hu, and making it into a counter electrode posed no special challenges. The article describing the work, "3D Honeycomb-Like Structured Graphene and Its High Efficiency as a Counter-Electrode Catalyst for Dye-Sensitized Solar Cells," coauthored by Hu, Michigan Tech graduate student Hui Wang, Franklin Tao of the University of Notre Dame, Dario J. Stacchiola of Brookhaven National Laboratory and Kai Sun of the University of Michigan, was published online July 29 in the journal Angewandte Chemie International Edition. Can cobalt nanoparticles replace platinum in fuel cells? The global Graphene Electronics market is expected to grow at a healthy CAGR of 55.54% from 2013 to 2023. In terms of technology, CVD (Chemical Vapor Deposition)process accounted for the largest market revenue in 2013, and expected to grow with CAGR of 53.15% from 2013 to 2023. The industry is also witnessing the spree of other technology mapping such as graphite exfoliation, scotch tape method, synthesis on silicon carbide (SiC) and so on. Okay...i think we all care about the science rather than the market/business world here.